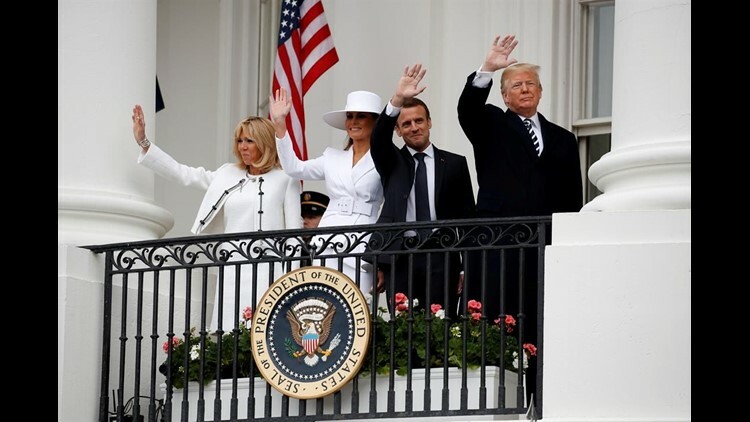 WASHINGTON (AP) — Praising the strength of America's oldest alliance, President Donald Trump welcomed French President Emmanuel Macron to the White House Tuesday with a pomp-filled ceremony on the South Lawn, opening a day of talks on the future of the Iran nuclear deal and the crisis in Syria. Trump said the partnership he forged with Macron at the start of his presidency was a testament to the "enduring friendship that binds our two nations." He thanked the French leader for his "steadfast partnership" during the recent missile strike in response to the chemical attack in Syria. Macron told Trump that together the U.S. and France would defeat terrorism, curtail weapons of mass destruction in North Korea and Iran and act together on behalf of the planet, a reference to Macron's work to revive a U.S. role in the Paris climate accord. "History is calling us. It is urging our people to find the fortitude that has guided us in the most difficult of times," Macron said. "France and with it, Europe, and the United States have an appointment with history."